Its been really long since I last posted here. Believe me, I missed it and no matter how hard I tried I couldn't because we were getting ready for Easter, then after the family get together I was recovering from Easter and yesterday my computer decided that it wanted the day off. So there was nothing much I could do about it. But I'm glad to be here today. I will be busy through this week with a wedding order and then on Saturday I'm off on a holiday for a week. Golly gee, I'm so excited, I can hardly wait for the weekend. 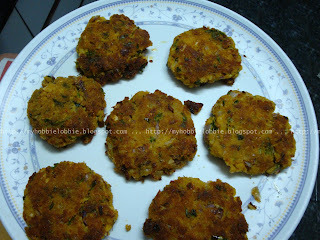 But before I go I'd like to share something really yummy with you guys - fish cakes or what we call fish cutlets. I love these cutlets. We don't make them too often, and I've always wondered why. We love them, they're crunchy little treats, and the flavors are to die for. It goes so well with a humble meal of rice and lentils, more commonly known as dal-rice and turns it to something quite extra-ordinary. If that doesn't float your boat, how about using it to make yourself a yummy fish burger? Whatever you decide to do with it, I'm sure you'll enjoy it. I mean, whats not to? For this recipe I used Kingfish slices. You can use any other white fleshy fish, but try and avoid the smaller varieties. Also, I've never really paid too much attention to quantities with any cutlets, its more about the mix feeling right to the touch. However, I have tried to give you an idea of the quantities I used. Feel free to adjust them as you like. In a vessel, boil the slices of fish with a pinch of turmeric powder, salt, whole cloves of garlic and a little water. The fish needs to be cooked through. Let it cool. While this is happening, chop up the onions, ginger, chillies and the coriander leaves and keep aside. De-bone the fish, making sure that no bones are left behind. Its rather unpleasant to find a fish bone in a cutlet. Add the chopped onions, chillies, ginger and coriander leaves. Crack into this 1 egg. Soak 1-2 slices of bread in water for a minute and squeeze out all the liquid and add one slice, crumbled to the mix. Using your fingers, make sure that all the ingredients are mixed well. Try and form a cutlet, if it holds well, you're good to go. If the mix is too moist, crumble the other slice of bread into it and mix well. Shape little portions of the mix into tightly formed cakes or cutlets. Coat with bread crumbs. Heat 2 tbsp oil in a large flat pan and fry the cutlets on a medium flame till they are golden brown. Turn over and brown the other side as well. The fish is already cooked, all you want to do is let the cutlets get a nice brown color and in the meanwhile heat right through. fish cutlets look so delicious and wonderful !! Thanks Sravani, Reshmi and Swathi! Must be a treat for fish lovers! Trisha, everything you make is touched with culinary magic. The turmeric, chiles, coriander and ginger sound like a wonderful complement to the fish!